The Alphonso Davies hype train was already hurtling along the tracks at a breakneck pace, but after his two goal haul in Canada’s 4-2 Gold Cup win over French Guiana, that train is now reaching supersonic speeds. Davies was the difference maker for Canada, and they needed him to be after seeing their comfortable three goal lead over the Gold Cup debutants reduced to one after giving up two goals in two minutes. Davies had added Canada’s third nine minutes earlier, and he was on hand again to secure the vital victory and fire home the fourth with five minutes remaining. It was an amazingly assured and confident performance from Davies on his competitive national team debut. 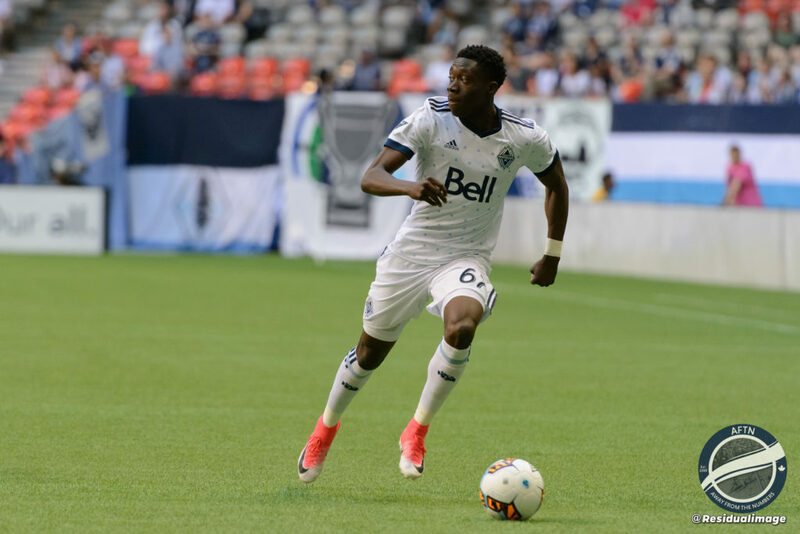 One which will likely see another couple of millions added to his growing transfer fee for the Whitecaps, and one that left his coach and his teammates raving about what lies in store for the 16-year-old. “He’s a young man with a tremendous future,” Canadian head coach Octavio Zambrano told reporters after the match. “Really, truly, the sky’s the limit for him and I say that because I know his personality. He’s a humble kid. As the great Pele once said, you have to be humble before you have to be great. 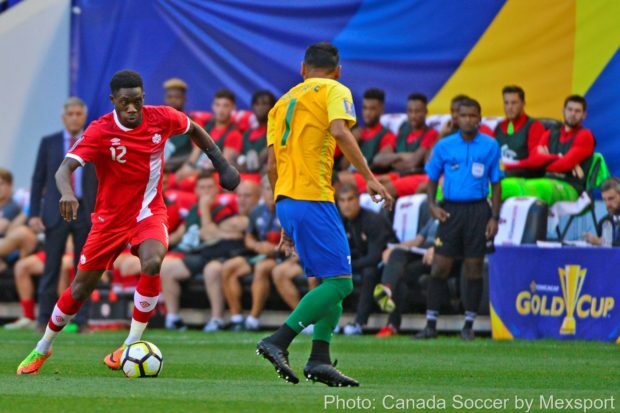 It’s been a whirlwind month for Davies, first getting his Canadian citizenship on June 6, then making his Canadian national team debut as a 53rd minute sub in the 2-1 friendly win over Curaçao in Montreal one week later. Friday night was Davies’ competitive Canadian debut and it doesn’t get much better than scoring a brace in a win. Davies started and played the full 90 minutes, and despite his young years, Zambrano said he had no qualms about blooding the Whitecaps winger for this important first match of the tournament. Davies undoubtedly turned a few more heads tonight. He’s already attracted a lot of attention with his performances for the Whitecaps and has been scouted by the likes of Manchester United, Chelsea, Liverpool, and Juventus. Turning it on in MLS is one thing, doing it on the international stage in front of a worldwide audience takes things to another level. And it wasn’t the watching scouts and his coach that were impressed by what they saw from Davies on Friday night, his teammates were equally in awe with what they’d just seen from him on the pitch, including another one of Canada’s goalscoring heroes on the night, Burnley midfielder Scott Arfield. “Fantastic,” Arfield enthused about Davies after the match. “He’s probably the most exciting kid, I think that’s the word, he’s still a kid, that I’ve ever played with or probably ever seen with my own eyes. I’ve been about for a long time and by far he’s the most technically gifted, humble, modest young man that I think is going to go from strength to strength. Patrice Bernier is another veteran that’s seen a number of Canadian, and other, young players come and go during his career. This is his fourth Gold Cup and the Canadian captain was delighted by what he saw from. Bernier’s see a bright future in the hands of Canada’s current crop of young talent, especially in the attacking department with the likes of Davies, Anthony Jackson-Hamal, and Lucas Cavallini. Bernier readily admits that Canada “hasn’t had that much threat altogether” for a long time and is another impressed by not only what Davies bring to the team, but by what it can mean to the national team’s future prospects. “At 16 I didn’t remember being like that,” Bernier quipped. “He’s very calm, mature. Just look at his finishing. He didn’t fluster. At 16-years-old he has quality but this was the first official game for him and in the tournament and he went out there and played.